3. Click the 'Start' button for the subject you want the student to begin Progress Monitoring (Mathematics or Language Arts). 4. In the CBM settings, you'll first want to select the level of CBM for the student. This should reflect the level of the student's intervention and not their current grade level. Classworks will select one grade level below the students current grade level specified in the users student settings. 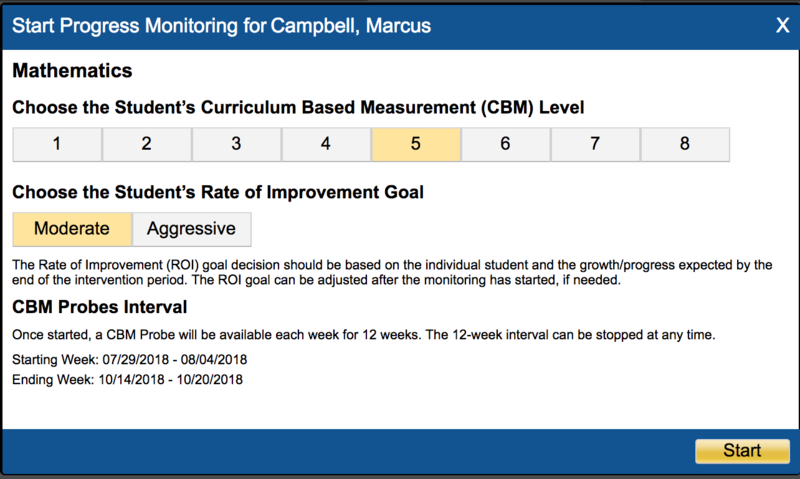 If the student has taken a Classworks assessment like the Universal Screener or Summative Benchmark then their CBM level will automatically be selected based on their results. You have the ability to manually select their CBM level, as well. Just click the level of CBM you'd like the student to receive. 5. Next, select the Rate of Improvement Goal for the student. This can be altered after the intervention has started if needed. 6. Once you've chosen the settings for the CBMs you can see the start and end dates that will be set when you click 'Start' and begin Progress Monitoring. The duration of the CBM is set for 12 weeks and can be stopped, or edited at any time.